Posted by J.S. Pailly on March 20, 2019 in A to Z Challenge, Sciency Words and tagged A to Z Challenge, Astrobiology, George Gaylord Simpson. Can God Be Found in Outer Space? Today I’d like to talk a little about religion. This is going to be kind of a personal post. Comments and discussion are always welcome, provided everyone remains respectful. While researching last week’s Sciency Words post on exotheology, C.S. Lewis’s name came up a lot. I didn’t mention this because Sciency Words is mainly about the etymology of scientific or science-related terms, and Lewis does not get credit for coining the term exotheology. As far as I can tell, he never used the term at all in his writings. However, one of Lewis’s essays is referenced so frequently in exotheological discussions that you might almost call it a founding document for the subject. It was published in February of 1963 in response to Russian cosmonauts who, upon returning to Earth from space, reported that they had not seen any God up there in the heavens. And, well, I guess that was supposed to settle the matter. The cosmonauts didn’t see God; therefore, God doesn’t exist. Q.E.D. To some, God is discoverable everywhere; to others, nowhere. Those who do not find Him on earth are unlikely to find Him in space. That line struck a curious chord with me. Some of you have been Internet friends with me long enough to remember that I was, at one time, a pretty devout church-going Christian. But in recent years, I’ve become disillusioned with the church and with the whole concept of organized religion. Why? Well, there are several reasons. One of the big ones is that I love space, and I love science, and for what seems to be a growing number of religious people, it’s not okay to love those things. Apparently. It’s also not okay to love certain people, apparently, but that’s a different story. I know not all religious people are like that, but enough of them are that I became very uncomfortable going to church, and so I stopped going. To my surprise, I don’t really miss it. I’ve found other ways to pursue my spiritual growth. One of my favorites involves dark, cloudless nights and my trusty old telescope. Because weirdly enough, and in apparent contradiction to what C.S. Lewis had to say on the subject, I have a much easier time finding God (or the divine, or the sublime, or whatever you might prefer to call it) up there in space than I do down here on Earth. Posted by J.S. Pailly on March 18, 2019 in Just My Two Cents. I was raised Catholic. I went to Catholic school, and when I was very young I remember a religious instructor telling a group of us Catholic boys about how God made “all life on the earth.” Naturally, I raised my hand and asked about life on other planets. The instructor assured me (rather impatiently, as I recall) that there is no such thing. This was not a satisfying answer for little me. It’s even more annoying to adult me. So it was with great delight that I recently became acquainted with a new term: exotheology. If there are living beings on other planets, questions—debated today in the relatively new field called exotheology—must be asked. For example, did the Fall occur on every planet and for every race? If it didn’t, was the Redemption needed for beings who had never experienced the Fall? If the Fall is universal, did Jesus have to go to every world to die and be resurrected, or were the events on Earth enough to cover everyone? If so, why is Earth so central? Are there other paths to redemption on other worlds? It’s not hard to see how this sort of theological questioning could go on forever. Indeed it could. No wonder that religion teacher didn’t want to get into this discussion with me when I was little! Based on my subsequent research, it seems the term exotheology isn’t that new. And lest you think this is a Christian only thing, it’s actually a Jewish rabbi who gets credit for the first usage of the term (or at least the first usage in print). In 1965, Rabbi Norman Lamm wrote this essay entitled “The Religious Implications of Extraterrestrial Life: A Jewish Exotheology.” Based on what I could read of Lamm’s essay, it sounds like the term “exotheology” was formed by analogy with “exobiology,” the scientific search for and study of alien life. The word exobiology has since been changed to astrobiology, but it doesn’t seem like exotheology has been updated to astrotheology yet. As for the big questions raised by exotheologists, I guess we’ll have to wait and see. If we ever do encounter an alien civilization, what sort of religious beliefs might they have? Would those beliefs match up at all with a Judeo-Christian worldview, or with any of the many other religious worldviews we have here on Earth? I don’t know (but that won’t stop me from writing a Sci-Fi story about it!). Posted by J.S. Pailly on March 15, 2019 in Sciency Words and tagged Exotheology, James Trefil, Judeo-Christian, Michael Summers, Rabbi Norman Lamm. I’ve been trying to think up a good way of indicating when one of these Story Time posts is set in the Chronoverse. I also want to make sure you know how each story relates to the others within the Chronoverse timeline. I think the best option is to just tell you all that up front. It goes against regulations, I know. We don’t assign family to the same ship or even the same squadron. Too many attachments, too much emotional baggage. It complicates the chain of command, it can cloud an officer’s judgment, etc, etc. I get it. But I made an exception. These two aren’t just family; they’re sisters. And they’re not just sisters; they’re twins. There’s a strange connection between them. It’s not telepathy. I had the medics test for that. No, they simply—it’s hard to explain. They simply understand each other. It’s like they’re of the same mind, two parts of a single whole. I’ve never seen a pilot/co-pilot team like them. Maybe that’s to be expected of two people who’ve known each other since the womb. Listen to their comm chatter and you’ll see what I mean. They communicate lightspeed fast. It’s hardly words. It’s not even battle code. One of them will give a yelp, or a grunt, or a sigh, and the other instantly knows what to do. And, well, yes… the two of them do have a reputation for insubordination. Minor insubordination, I assure you. A few adolescent pranks against their fellow cadets; nothing more serious than that. As I said, it’s like the two of them are of the same mind. It’s true when they’re in flight, or when they’re in the simulator, and maybe when one of them’s feeling a little impish, they’re of the same mind about that too. So yes, it was against regulations, but I authorized those two to train together and run the combat simulator together and take all their flight tests together. And now, even though this is also against regulations, I’m recommending that you assign them to the same squadron, the same ship. Demote me if you like, or lock me up in the brig if you think that’s necessary. But if you send the Kenzie twins to the front lines, if you put them together in the pilot seats of a star fighter, I promise you the Hykonian Hegemony won’t know what hit them. Posted by J.S. Pailly on March 13, 2019 in Story Time, The Chronoverse and tagged Chronoverse. Do you remember the children’s story “The Little Engine That Could”? Well, I’ve come up with a new nickname for Mars: the little planet that could. There are plenty of good reasons to believe that Mars is a dead world, totally devoid of life; and yet, stubbornly and persistently, Mars just keeps trying and trying to prove otherwise. The authors do say this in the abstract of their paper: “We interpret this feature as a stable body of liquid water on Mars.” So I get why the popular press was calling this an underground lake. However, based on what it says in the rest of the paper, it sounds more like we’re talking about mud: polar melt water plus Martian regolith. But I could be misreading this. And there are apparently a lot of uncertainties about this anomaly anyway due to the technical limitations with our space probe at Mars. So who knows? But there can be no doubt about this: we found something. Something anomalous. A distinctly watery kind of anomaly, based on comparisons with similar radar observations of Greenland and Antarctica. And again, because of the technical limitations of our space probe, there may be more watery anomalies all around the Martian poles. Maybe the Planum Australe anomaly is just “the big one,” and there are many other patches of mud that are too small for our instruments to detect. So could Mars support life? Mars is still a very cold, bleak, hostile place. But yes, more and more it’s looking like Mars could… it could… it could…. Posted by J.S. Pailly on March 11, 2019 in Space Science and tagged Mars, Planum Australe. 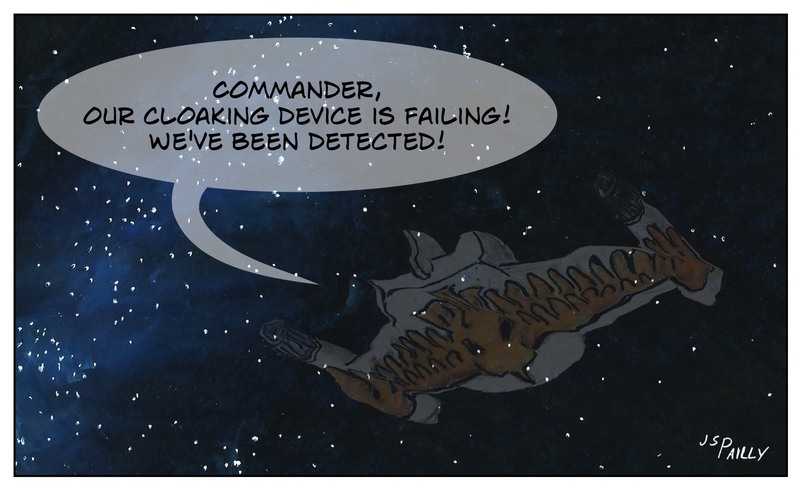 Last week, we talked about cloaking devices, a term and a concept that were invented by the writers of Star Trek. But in fact, during World War II the U.S. military conducted experiments that rendered aircraft virtually invisible. The technology came to be known as the Yehudi lights. Basically, Yehudi became the name for some mysterious person whom no one could seem to find. In this declassified military document, he’s referred to as “the little man who wasn’t there.” This is offered as an explanation for why the Yehudi lights got their name. It is known from data on the visual acuity of the human eye that, at a distance of two miles, individual lights are indistinguishable as such, if their spacing is less than about four feet. So by mounting lights on the wings and forward fuselage of an aircraft, and matching the color temperature of those lights to the surrounding sky, and flying the aircraft in just the right way relative to an observer, you could create the illusion of invisibility. At least from a distance. But by the time you got close enough to an enemy target that the enemy could see you, it was probably too late for the enemy to do much about it. Getting back to the Star Trek universe, there is a constant “arms race” going on over cloaking technology. The Federation keeps figuring out new ways to detect cloaked ships; the Romulans and Klingons keep figuring out ways to make their cloaked ships undetectable again. No one ever seems to hold the advantage for long. As Mr. Spock says about the latest Romulan cloaking device: “Military secrets are the most fleeting of all.” The same could be said about the Yehudi lights. They worked well enough, but only for a brief while. Then RADAR came along, and the Yehudi lights became basically useless. Posted by J.S. Pailly on March 8, 2019 in Sciency Words and tagged Cloaking Device, Star Trek, Yehudi lights, Yehudi Menuhin. Gosh, 2012 seems like such a long time ago…. Way, way back in 2012, I wrote a series of short stories about a time traveling news reporter. A few of you have been Internet friends with me long enough to remember that project. It was called Tomorrow News Network. I say these were short stories, but actually they were kind of long, more like novelettes. The challenge for myself was to produce ten of these stories in a year. It would have been twelve stories, but I wanted to give myself a little leeway in case anything went wrong. And things did go wrong. I missed my self-imposed deadlines on several occasions, and there were a few stories that really didn’t turn out the way I wanted. But still, by the end of 2012, I’d learned a lot about myself and my writing process, and I felt really proud of my accomplishment. Now here we are in 2019, and I am officially rebooting the story universe I created for myself way back in 2012. I’ve had a lot of time to think about how I could make Tomorrow News Network better. Also, I’ve had a lot of time to think about the continuity problems I wrote myself into in the original run of the series. And of course, my muse is here, providing me with all her wisdom and guidance, as she always does. So now I’m really excited to get the ball rolling again. I’m also kind of scared. I still remember how hard 2012 was and how emotionally drained I felt by the end of it. This time the plan is different, easier in some ways, harder in others. Perhaps much harder. So in conclusion, wish me luck. I’m going to need it! P.S. : I realize how busy everyone is on these Insecure Writers’ Support Group days, but if you have a few minutes to spare, please click here and check out the first little piece of the revamped story universe I’ve created. Thank you! Posted by J.S. Pailly on March 6, 2019 in IWSG and tagged Chronoverse, Tomorrow News Network. We were all that ever was, all that ever is, all that ever would be. We were everything and we were nothing, and we were content. To say that we were alive would be misleading, for there was no meaningful distinction to be made between life and non-life. To say we were conscious or self-aware would equally be a mistake. Nothing existed for us to be conscious of, and we had no meaningful concept of self to be made aware of, for there can be no concept of a self without a concept of others. We did not understand what this meant. We had no concept of a tomorrow or a today, no concept of time in any sense of the word. Even the idea of words, of communication, of information that could be passed from one individual being to another—why should such a thing be necessary when all is unity, all is harmony, all is one? These ideas were strange and fascinating to us—and frightening. The broadcast continued. It could not be ignored, nor did we wish to ignore it. And that, we would later come to understand, was the trap. The future is, by its very nature, an unknown quantity, a changeable quantity. But to learn of the future, to be informed about future events (or in our case, to become aware that future events exist at all) transformed this unknown, changeable quantity into an inevitable, unchangeable fact. One of the Tomorrow News Network reporters was explaining what religion would be. She was a confusing creature. We did not understand what she was. We did not know yet about humans, or females, or eyes, or the color violet; and yet the instant we perceived this female human we knew the color of her eyes was wrong. Unnatural. A sign of danger. We were appalled. Not only would there be separation and division, a plurality of people spread across a plurality of worlds believing a plurality of things—but all those people could not even agree to call a singular event by a singular name. Could nothing in this new universe be unified? Could nothing be made whole? We refused to accept this… or rather, I refused to accept it. The new universe was wrong. It should not be allowed to happen. And yet, even in thinking that thought, a thought distinct and separate from the thoughts of the others, I realized the damage had already been done. We were no longer one. I was myself now. The others were others, and we no longer existed together in a state of harmony. “What shall be must be,” one of the others assured me. “No, it must not,” I replied, but it was too late. Our quiescent non-existent existence was over. Our slumbering pre-universe was coming to an end. As separate entities, we all experienced the irresistible force of time: a sudden rushing-forward sensation from which there could be no escape. And then, it all began. Posted by J.S. Pailly on March 4, 2019 in Story Time, The Chronoverse and tagged Chronoverse, The Big Bang, Tomorrow News Network. There are certain topics that I think I know a lot about. Star Trek is one of those topics. But this post is the story of me being wrong about Star Trek things. Cloaking devices are a common trope in science fiction. They’re most closely associated with the Romulans, an alien race that sneaks around the Star Trek universe in their invisible spaceships, like the invisible spaceship pictured below. Star Trek often gets credit for popularizing cool ideas, but not for inventing them. I always assumed Star Trek popularized the cloaking device trope, but I figured the writers must have gotten the idea from somebody else—probably one of the early Sci-Fi writers of the pulp era. But I was wrong. According to Brave New Words: The Oxford English Dictionary of Science Fiction, the writers of Star Trek really did come up with the whole cloaking device thing. The term “cloaking device” first appeared in an episode called “The Enterprise Incident” in 1968. Except being the knowledgable Star Trek fan that I am, I still thought Brave New Words had made a mistake. If nothing else, they’d overlooked the 1966 episode “Balance of Terror,” when the Romulans and their cloaking technology made their first appearance (or rather, their first disappearance). Even after reading other sources (like this one) that said Star Trek really did invent the term cloaking device, and furthermore that the term really was first used in “The Enterprise Incident” and not “Balance of Terror,” I still didn’t believe it. When you think you know so much about a topic, it’s hard to admit when you’re wrong. I had to rewatch both episodes to see for myself. The point of all this is not just to tell you a cool thing about the history of Star Trek or how Star Trek has contributed to the Sci-Fi lexicon. The real lesson is this: no matter how knowledgeable you think you are about a given topic, there is always still something more you can learn! Posted by J.S. Pailly on March 1, 2019 in Sciency Words and tagged Cloaking Device, Romulans, Star Trek. So I’ve been working on two new stories, and I’m really excited about sharing them with you. They’re very brief. Really, they’re meant to give you just a small taste of the larger story universe I’ve been working on. Unfortunately, I hit a few snags with this week’s writing/art-making schedule. As it currently stands, one of these stories is written but not illustrated, and the other is illustrated but not fully written. It’s an awkward mismatch, to be sure! Anyway, you can expect to see the first story on Monday of next week, and the other one will be posted the week after that. In the meantime, I thought I’d share the first episode of a video series I’ve been watching on YouTube. It’s all about world-building in fantasy and science fiction, and it’s one of the things that’s been feeding my creativity of late. Please enjoy! Posted by J.S. Pailly on February 27, 2019 in Behind the Art, Behind the Writing.